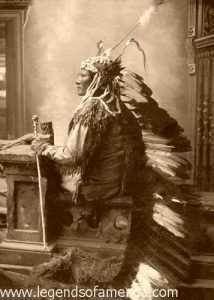 The noted Sioux warrior, Rain-in-the-Face, whose name once carried terror to every part of the frontier, died at his home on the Standing Rock reserve in North Dakota on September 14, 1905. About two months before his death I went to see him for the last time, where he lay upon the bed of sickness from which he never rose again, and drew from him his life-history. The old man lay upon an iron bedstead, covered by a red blanket, in a corner of the little log cabin. He was all alone that day; only an old dog lay silent and watchful at his master’s feet. “True, friend; it is the old custom to retrace one’s trail before leaving it forever! I know that I am at the door of the spirit home. “I was born near the forks of the Cheyenne River, about seventy years ago. My father was not a chief; my grandfather was not a chief, but a good hunter and a feast-maker. On my mother’s side, I had some noted ancestors, but they left me no chieftainship. I had to work for my reputation. “When I was a boy, I loved to fight,” he continued. “In all our boyish games I had the name of being hard to handle, and I took much pride in the fact. “Afterwards, when I was a young man, we went on a warpath against the Gros Ventre. We stole some of their horses, but were overtaken and had to abandon the horses and fight for our lives. I had wished my face to represent the sun when partly covered with darkness, so I painted it half black, half red. We fought all day in the rain, and my face was partly washed and streaked with red and black: so again I was christened Rain-in-the-Face. We considered it an honorable name. “I had been on many warpaths but was not especially successful until about the time the Sioux began to fight with the white man. 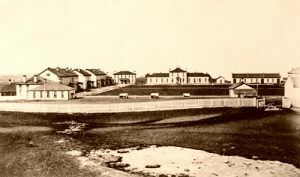 One of the most daring attacks that we ever made was at Fort Totten, North Dakota, in the summer of 1866. “Hohay, the Assiniboine captive of Sitting Bull, was the leader in this raid. Wapaypay, the Fearless Bear, who was afterward hanged at Yankton, was the bravest man among us. He dared Hohay to make the charge. Hohay accepted the challenge, and in turn dared the other to ride with him through the agency and right under the walls of the fort, which was well garrisoned and strong. “Wapaypay and I in those days called each other ‘brother-friend.’ It was a life-and-death vow. What one does the other must do, and that meant that I must be in the forefront of the charge, and if he is killed, I must fight until I die also! “Now the signal for the charge was given! I started even with Wapaypay, but his horse was faster than mine, so he left me a little behind as we neared the fort. This was bad for me, for by that time the soldiers had somewhat recovered from the surprise and were aiming better. “Their big gun talked very loud, but my Wapaypay was leading on, leaning forward on his fleet pony like a flying squirrel on a smooth log! He held his rawhide shield on the right side, a little to the front, and so did I. Our war whoop was like the coyotes singing in the evening when they smell blood! “The soldiers” guns talked fast, but few were hurt. Their big gun was like a toothless old dog, who only makes himself hotter the more noise he makes,” he remarked with some humor. “How much harm we did I do not know, but we made things lively for a time, and the white men acted as people do when a swarm of angry bees get into camp. We made a successful retreat, but some of the reservation Indians followed us yelling until Hohay told them that he did not wish to fight with the captives of the white man, for there would be no honor in that. There was blood running down my leg, and I found that both my horse and I were slightly wounded.